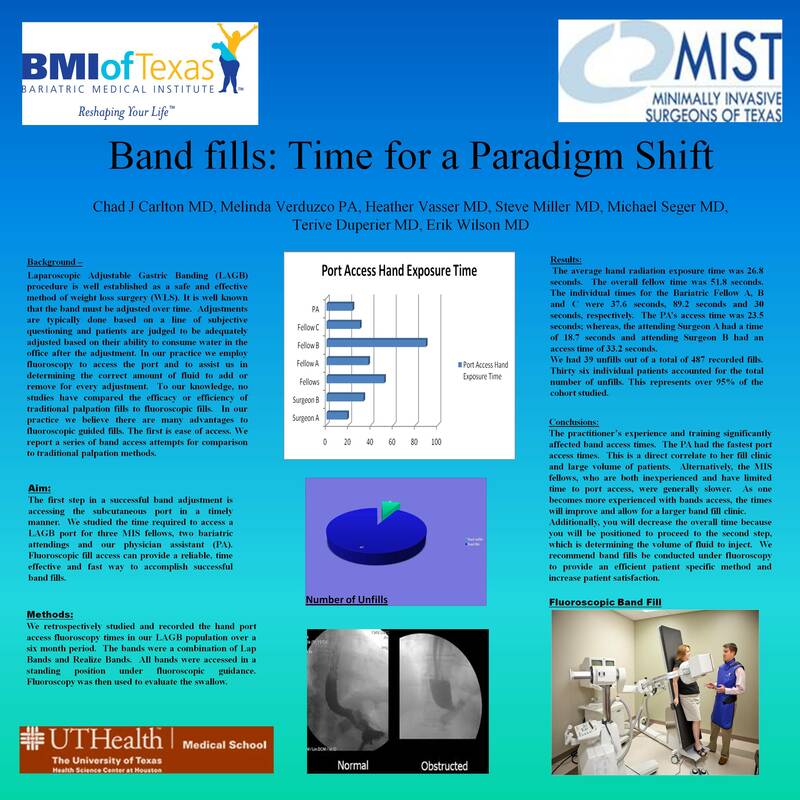 Fluoroscopic Gastric Banding (GB) fill access times can provide a reliable, effective and fast way to accomplish successful band fills. We studied the time required to access a GB port for a MIS fellow, bariatric attending and physician assistant (PA). We enrolled fifty six consecutive patients in the clinic and recorded the overall fluoroscopy times. We also documented hand radiation exposure times. All GB bands were initially accessed in a standing position. Fluoroscopy was then immediately used to evaluate the swallow. The average time it took to access the band was 70.79 seconds. The PA time was 70.86 seconds versus the attending time of 71.1 seconds and the MIS fellow time of 122 seconds. The overall average hand radiation exposure time was 28.1 seconds. The number of patients accessed significantly affected band access times. The PA and attending accessed over 15 patients; whereas, the MIS fellow accessed only 5 ports. As one becomes more experienced with band access, the times will improve. We recommend all band fills be conducted under fluoroscopy to provide an effective method and increase patient satisfaction.